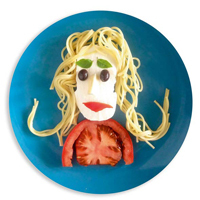 Inspire your kids to eat healthy foods with creative works of plate art by following easy-to-follow instructions and illustrations from the new “Funny Food Made Easy” book by Bill & Claire Wurtzel. Bill Wurtzel has been making these plates to teach and inspire children—and families—to improve their eating habits by creating meals and snacks that are not only nutritious but also fun. But these are not your mother’s smiley-face sandwiches. On Wurtzel’s plate-turned-canvas, carrots morph into airplanes, boiled eggs into jugglers, and pears into guitar players.